Can’t recommend. At best it’s a background movie as in something that could work in the background of something entertaining. Like having a few friends over, catching up with some drinks and maybe The Watch could be on at a low level. No need to follow the storyline that we’ve all seen before, or hang on the dialogue that we’ve all heard before. Every now and again, between sips, you and your friends might look up and see something slightly amusing, or hear a fun one liner. This movie could’ve worked better as a series of vignettes rather than a feature length narrative. It’s been a few days since I’ve seen it and I’ve been struggling to figure out exactly what it was that didn’t work. 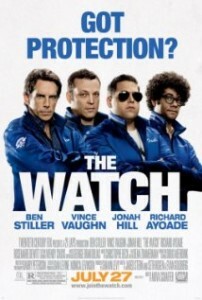 I like all 4 of the lead actors, especially Vince Vaughn. The 3 writers include guys who have helped write Pineapple Express, The Simpsons, Bolt and Goon and one of them is named Seth Rogen.Director Akiva Schaffer is one of the 3 Lonely Island boys who I absolutely adore.He also directed my dearly beloved Hot Rod and is behind many of the SNL Digital Shorts that make SNL worth while most weeks. What I’m saying is that this looked good on paper, but just didn’t work. Had this been released 10 years ago I think I might be singing a different tune, but it’s too late for a movie like this. We’ve seen this zane before. If Attack the Block , The Hangover and a handful of other male bonding movies hadn’t come to us over the last decade then I might just love The Watch, but they have and I don’t. It would be like Ford coming out with a hybrid car that gets 28 miles to the gallon. There are much better options that have already been released. Posted on Friday, August 3rd, 2012 at 9:04 pm and is filed under Reviews.